We also offer patterns and notions. Greetings! You've landed on Kay's original Bookshop web page. Kay would be delighted if you visited her brand new updated website, powered by Square. Click the link below to go now! 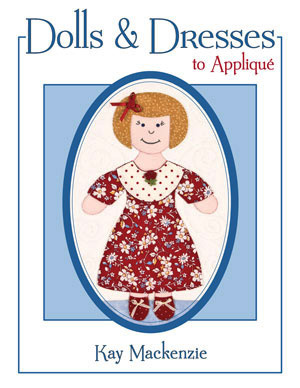 A dozen darling dolls in their delightful dresses, ready for you to appliqué using your favorite method. An overview of fusible machine appliqué is included. $15.95, 24 pages, soft cover, full-size patterns. 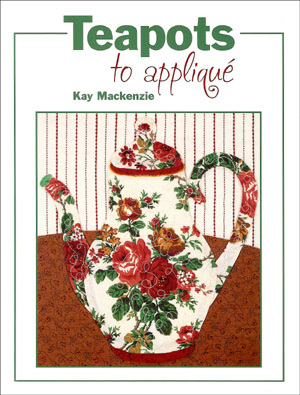 Kay presents 16 beautiful new teapot designs to appliqué using your favorite method. 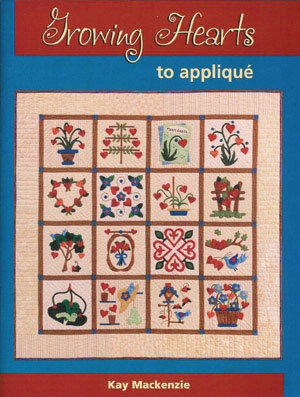 A sampler quilt pattern is included to show off your whole collection of teapots. You'll see color photos of quilts in a variety of styles as inspiration. Also presented: New! Kay's tips for no-template hand appliqué. Learn the "back-basting" method. color photos, resizing chart, illustrations throughout. 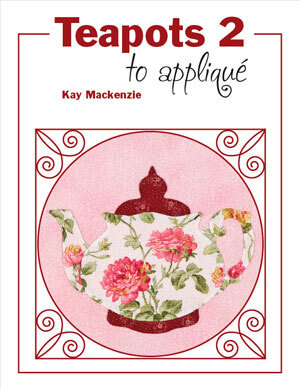 Kay's first teapot book is now out of print. However, a pattern pack including all sixteen designs is available. See the patterns page. Quilters love teapots! Sixteen delightful teapot designs to appliqué using your own favorite method. This book is now out of print. However, a pattern pack including all sixteen designs is available. See the patterns page. 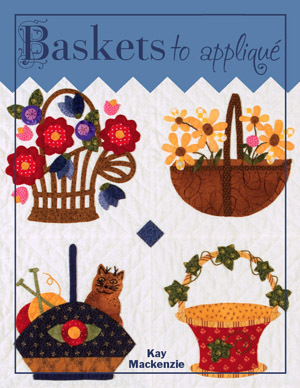 You'll fall in love with these charming basket designs to appliqué using your favorite method. Sampler quilt pattern included with all 16 blocks and a dogtooth border. This book is now out of print. However, a pattern pack including all 28 designs is available. See the patterns page. Happy Christmas designs in a variety of shapes and sizes that play nicely together. Use your favorite appliqué method. Love hearts? Here are sixteen flowering heart designs to appliqué using your own favorite method. Several quilt projects demonstrate use of the designs. Also presented: Kay's tips for freezer-paper-template hand appliqué. color photos, full-size designs, resizing chart, illustrations throughout. $12.95, 28 pages, soft cover, fully illustrated. Use your favorite theme from today's novelty fabrics to make a refreshingly fast, fun, and easy quilt top. No templates, no pinning, no fuss. Just cut, sew, and trim as you go. 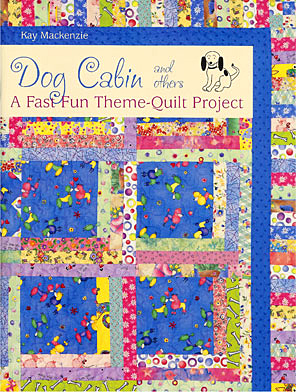 Quilter's Review says Dog Cabin is "a joy to read" and "a no-fail introduction to quilting." "What a great first project! What a great way to celebrate a particular theme fabric! Everyone will want one of these quilts." Visit QuiltersReview.com to read the full article. Experienced quilters will find this an enjoyable romp, a vacation from lengthy materials lists and intricate shape cutting. Beginners will learn valuable concepts and techniques that will serve them well throughout their quilting careers. Everyone will enjoy working with the delightful theme prints available today.